Writing down successful search strategies and where you have already searched in case you need to find more information later. Keeping print or electronic (sending to email or saving to flashdrive) copies of the full-text of resources you plan to use. Generating citations in the proper style for your bibliography. Citing information from particular sources in the body of your paper (called in-text or parenthetical citations). This video (2:14) explains why writers need to cite their sources. From Ohio University Libraries. This video (2:17) shows how to read and understand a citation for a journal article, book, or another type of publication. From the University of Arkansas Libraries. MLA (Modern Language Association) style is most commonly used to write papers and cite sources within the liberal arts and humanities. It is currently in its 8th edition (Purdue OWL). The examples below show you how to cite some common sources in MLA. within the social sciences. It is currently in its 6th edition (Purdue OWL). The best source for those random items you need cited: a lecture, course notes, mobile apps, social media, YouTube videos, etc. 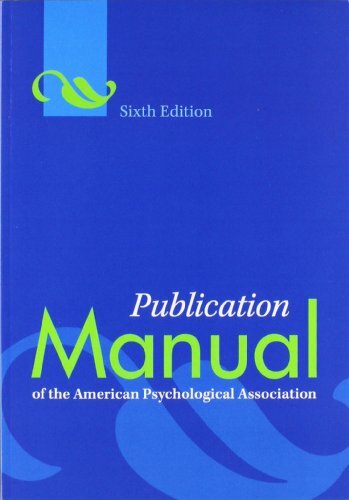 Run by a group of experts who work with APA Style every day and updated frequently. The Chicago and Turabian styles are nearly identical. The differences are mainly seen in how notes are numbered. Kate Turabian, the dissertation secretary at the University of Chicago for over 30 years, developed her guide for students and researchers writing papers, theses, and dissertations. Her manual is based on the University of Chicago Press's Manual of Style and departs from it in a few places. "Turabian," as her guide is called, synthesizes the rules most important for students' papers and other scholarly research not intended for publication, and omits some of the publishing details and options that "Chicago" provides. Chicago Manual of Style is currently in its 17th edition. Turabian is currently in its 9th edition. You can find the full guide to this style at the Information Desk at Waterfield Library (T11 S386 2006). The Social Sciences have several citation styles that are used within the various lines of study. The most common is APA. Information on this citation style can be found in an different tab. Some instructors would like their students to use the citation style that is used within their profession. Always check with your instructor to see what their preferred style is. Political Science uses the style of the American Political Science Association. An Online Writing Guide from the Trinity College Library in Hartford, Connecticut. This is one of the better APSA resources found online. Sociology uses two different styles, that of the American Journal of Sociology (AJS) and that of the American Sociological Association (ASA). There is a print copy of the full style guide for ASA at the Information Desk at Waterfield Library. Anthropology also has the American Anthropological Association (AAA) style guide. In brief, anything you have not thought of on your own must come from some source. This can be charts, tables, paraphrased sentences and paragraphs, summaries of ideas from your reading, and quotes. Major misunderstanding? Many students think that plagiarism happens when you forget to put quotation marks around direct quotations. That's wrong. Plagiarism does NOT just mean direct quotes. It's everything you have not created from scratch. For undergraduate students, this often means that almost everything you write needs "attribution" or citation. See the CITATION GUIDES boxes below for more information on citation styles. This interactive tutorial gives examples of written passages and has you decide whether it was plagiarism or not. From Southern Mississippi University. This site explains three often confused writing skills. From the Purdue Online Writing Lab (OWL). 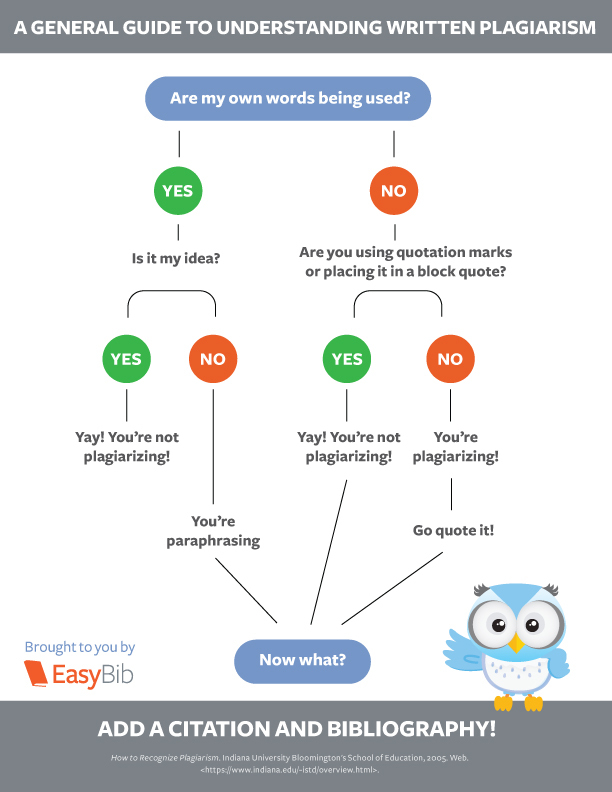 This tutorial gives examples of plagiarism (including some famous cases) and tips for avoiding it. From Indiana University.